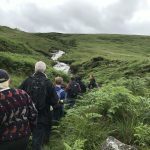 A walk on the southern border of the Monaliadh Mountains connecting the villages of Newtonmore and Kingussie. It passes through a land strewn with the remains of settlements ranging from prehistoric, medieval and post-medieval periods. Good views across upper Strathspey. Start from the cemetery 300m N of Calder Bridge off the A86 just W of Newtonmore at NN705989. Parking is available. At the N corner of the cemetery find the narrow path at the riverside and follow it E along the boundary of a small conifer plantation to a junction. Follow a wider path NE to the minor public road at NN708992. Cross the road and take the track N, which continues as a path to reach the Allt na Feithe Buidhe. Follow the path and the burn to the prehistoric Hut Circles on its W side. The largest, central one of three on a N-S line may be found at NH706017. Opposite, on the E side of the burn are the remains of post medieval Shielings consisting of the footings of at least 19 huts at NH707016. From just S of the Shielings follow the track SE for 1Km, where it turns S. Leave the track, heading E across two burns using stepping stones and a footbridge respectively, to reach a footpath following the S boundary of a conifer plantation. Continue E to the Township, where the path bifurcates at the foot of the W slope of the small hill Creag Bheag. This place, at NH735013 was called Auchtuchle. The remains of at least 12 buildings, some enclosures and a kiln-barn lie under the grass and heather. Take the right fork and follow the path E to the summit of Creag Bheag, 487m. Turn NNE and follow the path down the spine of the hill to a junction near the foot of Loch Gynack. Turn E and follow it for 400m to the Township of Toman an t-SeomairEX at NH753023. This settlement, date of depopulation unknown, has been partially destroyed by extensions to the golf course. It contains the foundations of over a dozen buildings, two of them re-roofed and re-used by the golf club. Continue on the path E to cross the Gynack Burn on the footbridge at NH755022 and reach the metalled track. Turn S and follow it for 1Km to Strathlynn, re-cross the burn and follow the road S to the CP at the public conveniences..
Grade: L; distance: 10km; height to climb: 287m; map(s): LR35, EX402. Meet at Spean Bridge WM at 9am, for start of walk at 10am. Leader: Rick Atkinson 07587 549731. 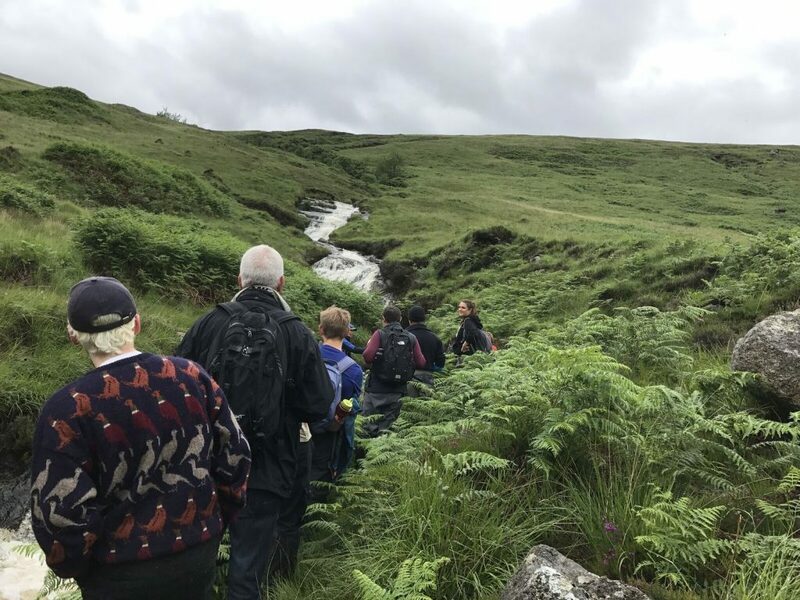 A walk in the lead mining area famous for the discovery of the mineral Strontianite in 1790, from which the metal Strontium was first isolated. Start from the hotel at NM800615, where parking is available. Take the minor road, which soon becomes a footpath, NE to a junction at NM813633. Fork left and follow the path NW to its highest point at NM797652, alt 393m. Leave the path and head NE across rough undulating terrain to reach the lochan at NM808657, then N to reach the summit of Meall Iain, 502m. Descend the E ridge to the watershed and join the path at its head at NM818661. Take the path E, past disused mine shafts, whence it improves to a track. Further E is a more recent quarry and more disused mineshafts. Continue E to reach the public road at the foot of a steep hill. Cross the road and follow a short track to see more old shafts and mine workings. Return to the road and follow it S to Ariundle visitor centre..
Grade: M; distance: 13km; height to climb: 520m; map(s): LR40, EX390/391. Meet at Corran Ferry slip for 9.15am sailing, for start of walk: 10am. Leader: Gerry Gilbert 07765 830203. Park at Laggan Locks. Cross the Laggan Locks and follow the forestry track SW to Kilfinnan. After crossing the Kilfinnan Burn turn W at NN276957 to start climbing towards the east ridge. When the climb becomes less steep turn WSW at NN265959. Head SW along the ridge over Meall nan Dearcag (689m) and Sean Mheall (887m) passing close to the lochan at NN252946. From Sean Mheall continue WSW along the wide ridge bearing NW at NN226944 towards the summit of Sron a Choire Ghairbh (937m). From the summit, head NNW following the curve of the ridge towards Meall a Choire Ghlais (900m). Turn E at NN217954 to leave the ridge and descend down the Coire Glas towards Loch a Choire Ghlais. Follow the Allt a Choire Ghlais NE keeping to the north side and passing above Kilfinnan Falls before turning SE to descend steeply to rejoin the forestry road NE of Kilfinnan and head back to Laggan Locks. Alternatively, from the summit of Sron a Choire Ghairbh follow the south-east ridge of Sron a Choire Ghairbh and descend to the stalkers path at NN224940 to join the Cam Bhealach and forestry road along Loch Lochy back to Laggan locks. (16km, 950m ascent). Suggested by Kate Willis; coordinated by Kate Willis.